CommonSpirit Health is a nonprofit, Catholic health system dedicated to advancing health for all people. It was created in February 2019 through the alignment of Catholic Health Initiatives and Dignity Health. CommonSpirit Health is committed to creating healthier communities, delivering exceptional patient care, and ensuring every person has access to quality health care. With its national office in Chicago and a team of approximately 150,000 employees and 25,000 physicians and advanced practice clinicians, CommonSpirit Health operates 142 hospitals and more than 700 care sites across 21 states. In FY 2018, Catholic Health Initiatives and Dignity Health had combined revenues of $29.2 billion and provided $4.2 billion in charity care, community benefit, and unreimbursed government programs. As a mission-driven health system, CommonSpirit Health is committed to building healthier communities, advocating for the poor and disenfranchised, and innovating how and where healing can happen—both inside our hospitals and out in the community. 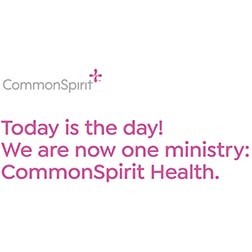 CommonSpirit Health was formed by two of the nation’s most respected nonprofit ministries, Catholic Health Initiatives (CHI) and Dignity Health. Founded by women religious, both health systems have a long, proud legacy of serving all people in need, especially those who’ve been made vulnerable by poverty, age, and other hardships. CommonSpirit Health is continuing these legacies by actively advocating for positive social change. Catholic Health Initiatives and Dignity Health combined provided $4.2 billion in charity care, community benefit, and unreimbursed government programs in FY2018. CommonSpirit Health supports a broad range of community-based health programs to treat the social needs that impact health and well-being, including: affordable housing, homelessness, violence prevention, human trafficking, and a healthy environment. Our combined strengths allow us to improve access to outpatient and virtual care settings, offering care closer to home. We will also continue to invest in clinical programs to keep aging populations and people suffering from chronic illnesses healthier. CommonSpirit Health’s size also allows us to expand our ability to invest in digital technologies and innovations that can create a more personalized and efficient care experience regardless of location. Consistent with the heritage of our two legacy organizations, the new ministry will be Catholic. We have a long history of partnering with providers of all faiths and backgrounds, and that will continue. A number of facilities in our system have not been Catholic in the past, and their status will not change. All of our facilities will continue to operate in alignment with CommonSpirit Health’s mission and values. Our hospitals and clinics will continue to operate under their current names in the communities we serve. The new health system is led by the Office of the CEO. Lloyd H. Dean, Dignity Health’s CEO, and Kevin E. Lofton, CHI’s CEO, will each continue to serve as CEOs under the Office of the CEO, with independent responsibilities and decision-making authority. Together, Mr. Dean and Mr. Lofton will work side by side with executive leadership to plan a successful integration and future of CommonSpirit Health. The new executive leadership team was announced on December 4, 2018. The new Board of Stewardship Trustees was announced on October 16, 2018. CommonSpirit Health’s national office is in Chicago. The city was selected because of its central location, convenient access to all parts of the country where our ministries are located, and good infrastructure to support a national organization. Our press center, FAQ, and leadership bios are on our website commonspirit.org.